Ross French is the senior delegate from UC Riverside and president of the UCR Staff Assembly. 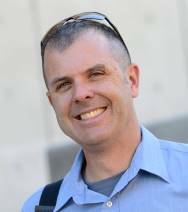 He has worked at UCR since 2000 and currently serves as the digital communications manager at the UCR School of Medicine. Since graduating from UC Santa Barbara in 1993, he has spent the majority of his career working in higher education, with all but three-plus years of his 20-something-year career in the UC system. Ross previously served on the UCR Staff Assembly Board as communications director in 2013-14 and 2014-15. His goals for Staff Assembly and CUCSA are to continue to work to build and improve lines of communication both among staff members and between staff, faculty and students, both inter- and intra–campus, as well as to build awareness of the organizations and what they do to improve the staff experience.